We signed petitions. Wrote letters. Got on the bus to Albany. All to no avail. Boycott/refusal/opt out—however you phrase it—remains the ONLY tactic that we have to force change so that ALL our children have the enriching, citizen-building public education they deserve. The 2018 NYS ELA test is less than 4 weeks away! For opt out to be effective, we need families refusing the tests in every district and in numbers. That can only happen if we all pull together to organize and get the word out. Seriously, this is an all-hands-on-deck situation. Can we count on you commit to one or more of the following? 1) Distribute postcards. We are especially trying to reach parents who have less access to information (whether due to language barriers or other disempowering factors) and so may not know their rights. We have 2 flavors of postcard this year, one of which is in both English & Spanish. Hand them out in person at schools, playgrounds, etc or leave a stack at a café, laundromat, library, etc. If you can do this, email janinesopp@gmail.com and write Postcard Distribution in the subject line. Indicate in your message how many cards you want and which design or designs. 2) Help organize a press conference. The Department of Education has been pressuring administrators and feeding the public flat-out lies in a deliberate effort to squelch opt out. So we’re joining with students to push back and to demand that the city respect parent and student rights. Our student-centered press conference is tentatively scheduled for 4 PM on either Thurs March 22 or Tues March 27 (depending on availability of the City Hall steps). Please email kemala@nycpublic.org (Subject: Press Conference) right away if you can help with this. Spanish speakers. More and more Spanish-speaking parents are interested in opt out. If you are able to help organize or translate, please contact us. Please do your best to pitch in to the full extent you’re able. In the meantime, if you haven’t already, join our Facebook group and use (and share!) our newly redesigned website, optoutnyc.com. Both are incredible resources! Special thanks to Amy Gropp Forbes for all her hard work on the website redesign and to Ilana Greenberg for another attention-grabbing postcard design. Is Danielson Making You Sick? Do you dread the Danielson based drive-by observation and the inevitable feedback session and rating, which happens not only once or twice, but several times a year, even though you have consistently received effective and highly effective ratings throughout your career? Do you feel as if you have lost all pedagogical control over what you teach and how you teach it? Do you feel utterly devalued as an educator and a professional and thrown up your hands in despair, because nothing you do is quite good enough? Have you experienced a significant increase in your workplace stress level, lack of sleep and even health related issues, all stemming from a punitive evaluation system which has demoralized you and stripped you of any sense of empowerment and self worth as a professional and educator? If so, you are not alone. 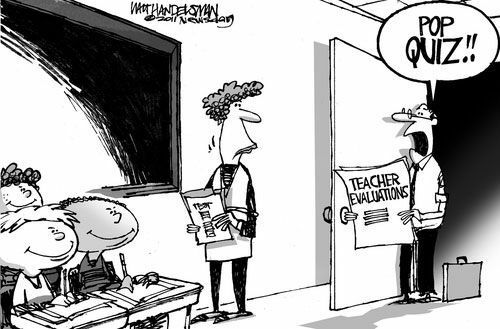 The upcoming contract negotiations has educators all over the city wondering if the UFT leadership realizes just how bad teaching conditions are under the current evaluation system, and whether or not it will make it a priority to demand a lowering of the mandated evaluations to the New York State minimum of two per school year (for starters).